So this is basically the same recipe as Beer #6, brewed way back in 2011. Most of the differences stem from availability rather than any sort of meaningful consideration. That original batch turned out fantastic and may be my overall favorite batch of homebrew, so I didn't want to change much. I'm cutting it a little close in terms of timing this year (started about 3 weeks earlier back then), but it should be ready to go by Christmas, which will be good enough for me. No changes to the steeping grains. I added one extra pound of Amber DME because I thought I was a little under target last time (as it turns out, I probably wasn't). 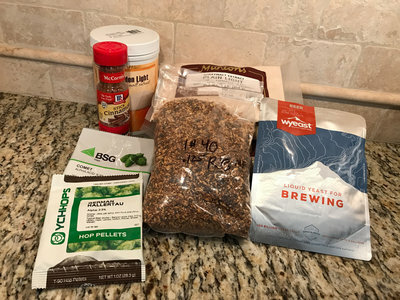 I am using Comet hops instead of Northern Brewer, mostly because the homebrew shop didn't have the latter and the former has a comparable (slightly higher) Alpha Acid percentage (which, since I'm using more malt, should work out). I'm using fresh orange peel (I peeled it off an orange myself!) because I forgot to get the bitter orange peel when I was shopping and fresh is probably better anyway, amirite? Finally, I went with American Ale II yeast this time, again because homebrew shop had just ran out of regular 1056 American Ale yeast (which is actually pretty surprising). Original Gravity: 1.072. Hoo boy, I miscalculated something with this beer (target was 1.060, I'm guessing the use of LME is screwing up my normal calculations). Refractometer readings were 17.5-18 Brix. That being said, assuming 75% attenuation, this puts the beer at about 7.3% ABV, which should be fine by me. I have high hopes for this. I loved the original beer, but I haven't really attempted to make the same beer very often, and this one has more variables than normal. Regardless, I'm sure I'll end up enjoying this stuff. Up next, I've been meaning to do a Scotch Ale aged on oak cubes (that are currently soaking in Aberlour A'Bunadh) for a while, so that's certainly a candidate. Crom Approved might be up for another at bat soon as well. And I also want to do a funky saison, brewed mostly with Brett. Will I get to all of these this year? Probably not! But I'll give it a shot. This page contains a single entry by Mark published on November 30, 2016 10:44 PM. Fantôme Artist 2 was the previous entry in this blog. Tröegs Bourbon Barrel Aged Impending Descent is the next entry in this blog.